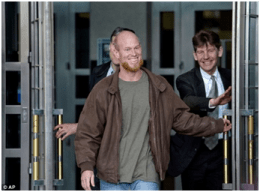 Peter B. Collins Presents Eric McDavid In a surprise move on January 8, a federal judge ordered the immediate release of a self-described “green anarchist”, EricMcDavid, after 9 years on a 20-year sentence. Prosecutors withheld thousands of pages of evidence in winning a conviction for conspiring to damage corporate and government property. As in most domestic terrorism prosecutions,McDavid was framed by a paid FBI informant named “Anna” who teased him sexually, suggested a scheme to sabotage a dam in California, and doled out cash to pay for living expenses and the chemicals to be used for a bomb. Anna was paid $65,000 to set upMcDavid, and two co-defendants were turned by prosecutors and provided false testimony. *Eric McDavid was a drifter who was hitchhiking to New York to protest the 2004 Republican National Convention when he met “Anna”. He now attends community college. Read more about his case here.